Outside: 2 zipper compartments + 1 front zipper pocket (8.3" L x 5.5" H) + 1 back zipper pocket (6.3" L x 4.3" H). Inside: 2 slip pockets in the front compartment + 1 wall secret zippered pocket inside the rear compartment. Medium size, it can help us keep different things organized. This cross body bag has enough room for your cell phone, iPad mini, wallet, keys, cards, tickets, makeup kit, etc. · Long adjustable strap. Strap length: 24.8-49.6". Wear as a crossbody bag or shoulder bag. 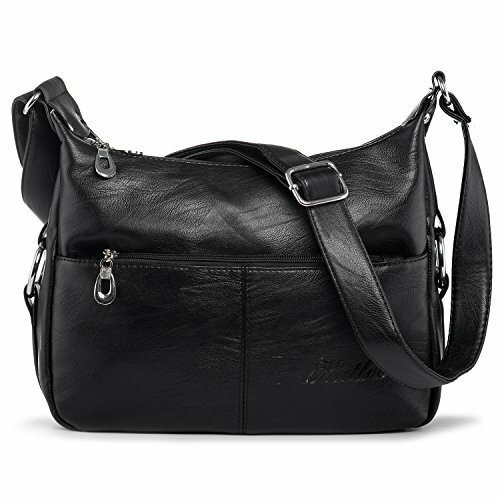 · Both the main part of the purse and shoulder straps are made with quality PU leather. Supple and comfortable. · Front and back zipper pockets for sorting cellphone and smaller things like coins, keys and cards. · At two sides, a decorative silver metal ring brightens up the black purse, adding fashion and beauty to the bag. It's ideal for work, shopping, gathering, dating, weekend traveling, etc. It's great whenever you need to carry your necessities easily without carrying a big purse. Material: Soft synthetic leather. Brown smooth fabric lining, modern silver-colored hardware as strap hooks, decoration and zipper pulls. Synthetic leather shoulder strap. Feature: Pure black color. Long shoulder strap, length: 24.8-49.6", width 1.2". Top zipper closure. Two main zipper compartments. One wide zipper pocket on the front. A small concave brand logo at the lower corner. Approximate dimensions: 11.4" L x 3.5" W x 7.9" H. Comfortably holds your cellphone, iPad mini, makeup kit, wallet, etc. A 9.7" iPad with slim case can also fit in the main pocket. A 6.3" x 4.3" zipper pocket at the back for small things. Pocket: Two main zipper compartments with 2 interior slip pockets and 1 wall zippered pocket inside. One front and one back zippered pocket. Occasion: Casual, used as an everyday bag. Suitable for work, travel, dating, gathering, shopping, etc. Please be sure to compare the purse with any bag you have in case the size doesn't meet your expectation. Package will also come with an extra nail clipper as a bonus.